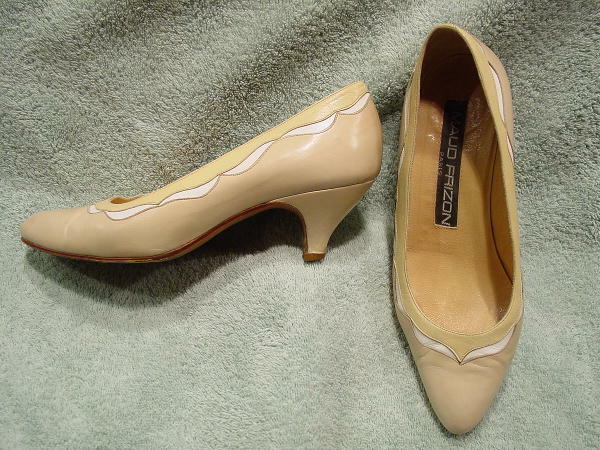 These bone-beige pointed toe pumps are by Maud Frizon and were made in Italy. They have tan leather linings, cute little princess heels, and modified pointed toes. Near the top edge is a faux white ribbon design adjoining a creamy bone scalloped border trim. The right lower back heel has 3 scrapes as it touches the rubber heel. They have some light scuff marks. The left shoe toe area on the left side has a leather age darkening spot. 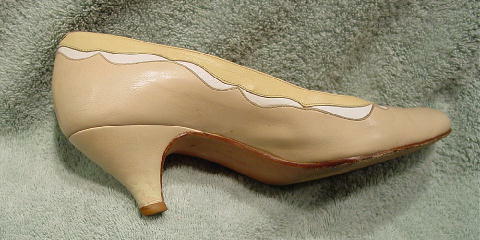 The left heel has some discoloration near the rubber heel. They're from a younger New York model, whose feet grew.